Only 10 paintings have sold for over 100 million dollars. The latest to join the club: Jean-Michel Basquiat's 1982 "Untitled" painting of a skull. Basquiat is now in the same realm as Picasso, and his skull painting is now the priciest piece sold by a US artist. Guess how his art career started......a trend that is hot right now but this was in the 70's (again, trendsetter)......street art. 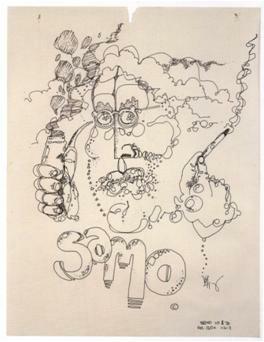 He began as a graffiti artist in 1976 under the name SAMO. The work was made up of interesting combinations of words and symbols. 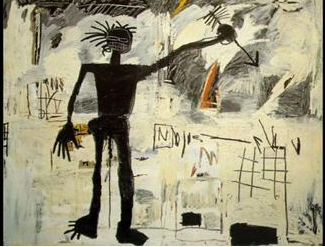 From subway walls, he moved up to canvas and the Soho galleries, and was a smashing success. Unfortunately, he then again transitioned, but not in a good way. He moved from the toast of the town to a recluse fighting with heroin. He unfortunately died at the early age of 27 from a heroin overdose in 1988. After his death, his work skyrocketed and influenced generations of artists. 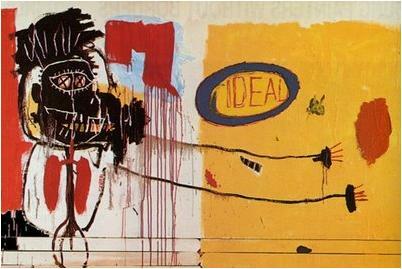 Last year he became the highest-grossing American artist at auction, generating $171 million from 80 works. Who was he friends with? People like Keith Haring and Andy Warhol. An interesting point of comparison: Basquiat's skull painting sold at a higher price than his friend and mentor Andy Warhol, whose "Silver Car Crash" sold for $105 million.